Upcoming Release Schedule and a Giveaway! I am leaving on Tuesday afternoon for one of the largest writing conferences in the world, the RWA (Romance Writers of America) National conference, being held this year in Orlando, Florida. The location changes, although every four years or so it heads to NYC, since that is publishing central. I usually go to that one because I can get there by bus (5 1/2 hours!) but Orlando is close enough to manage, and it is the only place I get to meet up with my agent Elaine Spencer in person, so I decided to go this year even if it meant flying. I'm going to be sharing a room with the lovely Maria V. Snyder, who is not only an incredible author whose work I adore and admire, but a very cool person to boot. So yay for that! I'm also going to get a chance to meet up with a bunch of author friends who I never get to see otherwise, do some networking, and take a few workshops that might help with some of the new directions my writing is heading in. Thankfully, I have an amazing cat sitter coming to take care of Mystic, Magic, and Angus--she used to work at a vet's office, so I know that Mystic (who is doing quite well) will be in good hands. It makes it a lot easier to go than it would be otherwise. Thanks, Alicia! On Saturday, there will be a Literacy Signing from 3-5PM. It is open to the public and the proceeds all go to benefit literacy (and there will be hundreds of great authors there, some of them WAY more famous than I am). I hope if you are local, you'll stop in and say hello. Here are a few pictures from past conferences--I'll post an update with new ones when I get home. Are any of you going to be there? The lovely Patience Bloom--I can't wait to see her this year! Let me know if you're going to be there! Yes, it's giveaway time again! I'll have another one soon with some themed items relating to the book, but I want to give people a little time to read first. As always, just use the Rafflecopter form below. (Yes, you get to take credit for things like following the blog if you've already done it.) No purchase is necessary, although of course I'll love you forever if you actually buy the book. It's also REALLY important to get those first few reviews out there, so if you did read it and liked it, I'd be seriously grateful if you'd put up a review at places like Amazon, Goodreads, and B&N. Just spreading the word is helpful too. Have I mentioned recently how much I love my readers? Big giveaway coming this week! 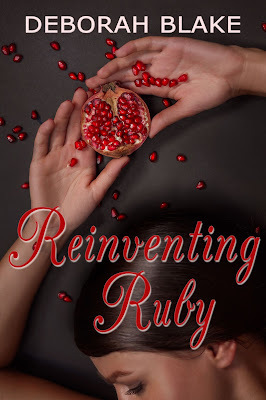 But for now, it's release day for REINVENTING RUBY!!!! I hope you love her. If you read it, let me know what you think! So, unbeknownst to most of my readers, I have been preparing to shift gears away from doing just Paranormal Romance and Urban Fantasy (although I will probably still be doing some of that) to writing some contemporary romance as well. I’ve wanted to write romantic comedy for years—who couldn’t use a laugh these days?—and it is finally coming back into the market. In addition, I like contemporary romance set in small towns, women’s fiction (especially if it has some humor in it), and of course, the occasional foodie romance. Ruby Tate is a cautious and controlled woman; her only passions are cooking and her restaurant, Jewels. Unless you count the uncharacteristic one-night stand she had with a charming stranger the night of her sister’s bachelorette party. And she doesn’t. After all, she got out of his bed the next morning and returned to her real life—dealing with a failing restaurant, a not-so-silent silent partner, and a difficult family. And now there’s this new problem, like a ticking time bomb hiding beneath her white chef’s jacket. Jonathan Gautier is a rising star in the culinary world. With three successful restaurants, a best-selling cookbook, and a new television show, he should be happy, but after six months on the road filming Seven Worth Saving and working in everyone’s kitchens but his own, Jonathan is burned-out and uninspired. The closest thing he’s had to a social life was one amazing night with a woman whose name he isn’t even sure of. All he wants is to wrap up this last episode and get back to his own kitchen. Maybe there he’ll be able to recapture his love of cooking, because if he can’t, he doesn’t know what on earth he’ll do with his life. When Jonathan walks into Jewels, Ruby is horrified. She can’t believe that the famous chef who is her only hope for saving her restaurant is the man who gave her the best night of her life, and a little something extra. All she wants now is for him to help her save her dreams—and then go away. But Jonathan has other ideas. Lots of other ideas; most of which involve Ruby, food, and nakedness. And Jonathan didn’t get to be the success that he is by taking “no” for an answer. Together, they must find a way to save Jewels, even if that means completely Reinventing Ruby. I really love this book and I hope you will too. I have to warn you, it is a little (coff) spicier than my Baba Yaga books. Let’s just say that all the heat isn’t in the kitchen! 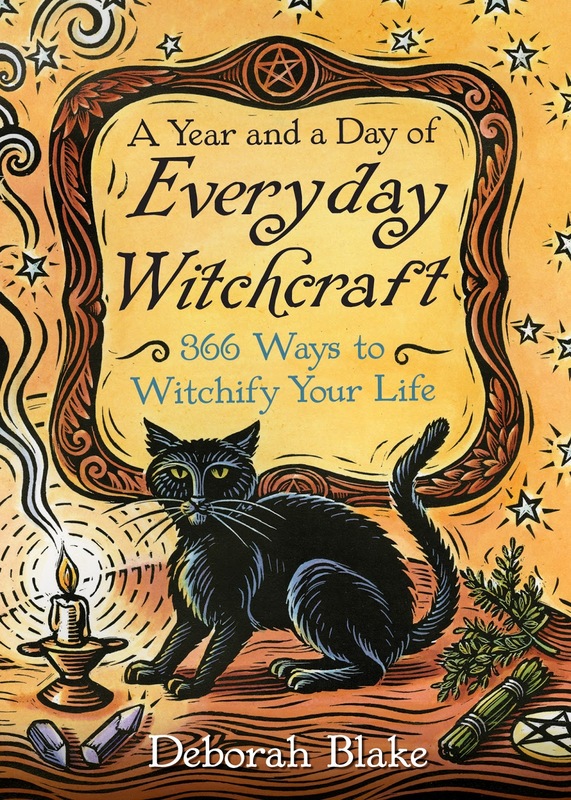 There are no witches or dragons, but there are some fun recipes as a bonus at the end. If you like my other books, I hope you’ll follow me along on this new adventure too. Here are some buy links for the ebooks. The book releases on Monday, July 17th, but the preorders are live now. I know that some of you really prefer print books, so I’ll be making a print version available through Amazon’s POD (print on demand). It will have to be more expensive than the digital version because of the additional costs of the printing, but I wanted to at least be able to offer you the option. It may take us a couple of days to get the print version up there, but it is coming. I'll be doing a giveaway sometime next week (I'm waiting for some special-order goodies), so be sure to check back. You know how I love my giveaways. I’d REALLY love it if you would spread the word far and wide. If this is a success, there may be a few more surprises for you down the road. Thanks as always for taking this journey with me! So I've been hard at work on The Book of Cat Magic for Llewellyn (my 11th book for them, not counting the tarot deck!) and hope to finish it today. Another couple of days to polish it up, then it will be off to my beloved editor Elysia, and I will be starting work on another novel. I'm prepping to go to the RWA (Romance Writers of America) National Convention at the end of this month. This year it is being held in Orlando, Florida. I'll get to meet up with my agent and lots of author pals I rarely see, so it should be fun. Anyone else going to be there? This fall is going to be busy! 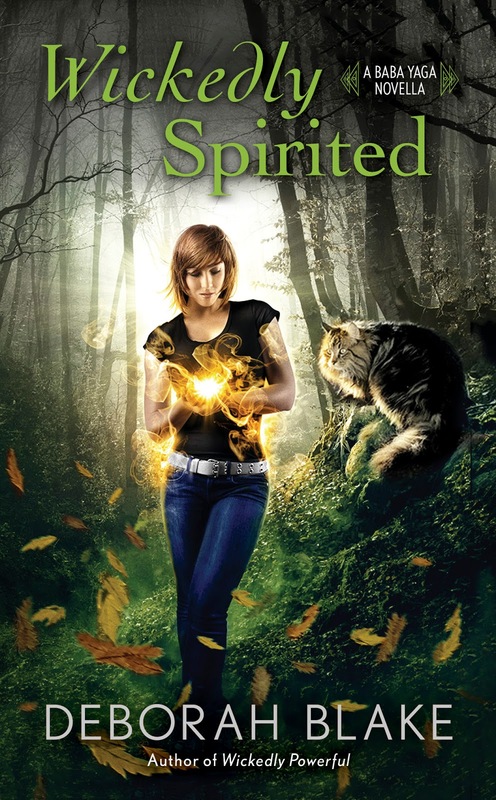 First up, we have the next Baba Yaga novella, Wickedly Spirited. This one features Jazz, the teen that Bella rescued in WICKEDLY POWERFUL (the 3rd Baba Yaga novel). 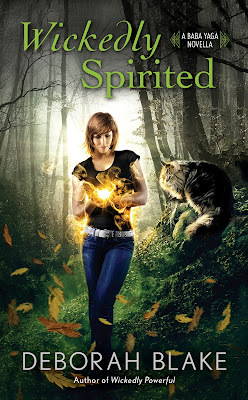 Wickedly Spirited comes out on September 19th--it seems like a long way away, but it is only 2 1/2 months from now! If you haven't read WICKEDLY POWERFUL yet, you've still got time to catch up. (I'm going to help out with that, as you'll see.) And it's only $1.99! What do you think? Is he impressed? Or annoyed? Then the book I can't wait to share with you--the second in the Rider series! 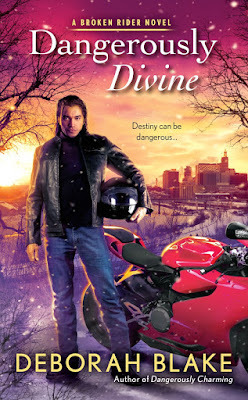 DANGEROUSLY DIVINE is Gregori Sun's story, and will be out on November 28th. If you haven't read the first Rider book, DANGEROUSLY CHARMING, you still have a few months to catch up on that too. Oh BOY, do I love this cover! Yum! Feel free to run and preorder all of these. No, really, I'll wait. Oh, you're back? Okay, then I guess I'll reward you with a giveaway! I haven't done one for a while, so I thought I'd help out those of you who haven't read WICKEDLY POWERFUL yet, so you'll be ready when the novella comes out. Of course, if you already have the book, this way you'll have a signed copy, plus a cool new dragon friend. And some bookmarks, because who doesn't need more bookmarks?